Welcome to Strategy One. We were offline for a while changing owners but rest assured we are back for good and your favorite NPC Calculator is as well. Check back often because we will be adding much more content soon. The NPC calculator is a great tool for figuring how best to use your resources for multiple builds. For example: A field upgrade, a building upgrade, a shield upgrade, and two or more different troop types? And that’s where this calculator comes in handy. You can enter any possible combo of troops, and up to five other types of upgrades/researches/purchases, and it will instantly calculate it. 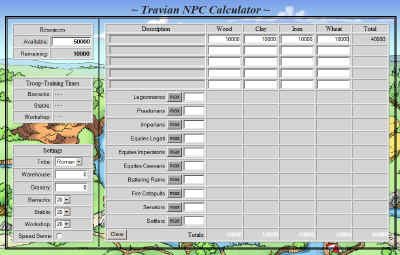 The Travian NPC Calculator is back online with a new look but the same functionality as it had before. Click on the graphic to go to the calculator.